I just want to complain about how long it takes to sew rings on draperies!!!! 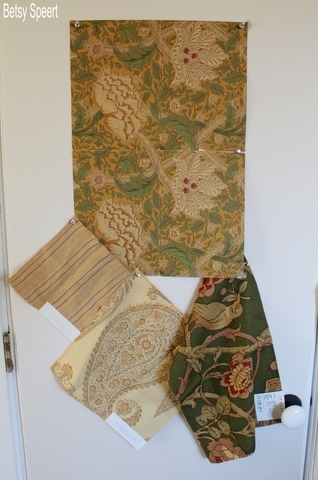 I am sewing my niece Miriam's living room draperies, and I want only the best for her. I just think they look better when the rings are sewn on. We have been looking at my buddy, Kris's bedroom. 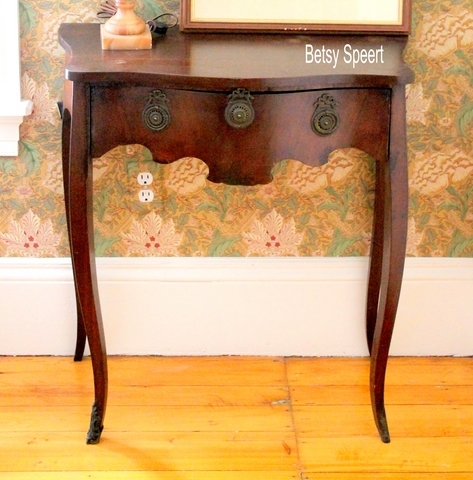 Next up is her night table. 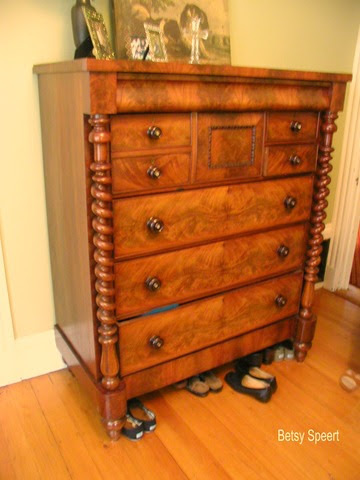 Up to now, the furniture she's been using for her bedroom has been an old, heavy Scottish beauty. But, she wanted to go with a lighter feel. So this behemoth was moved out to the hall. Now she's complaining about it in the hall. Next thing I know, it will end up going to auction. She wanted a less massive feel in her newly designed bedroom. 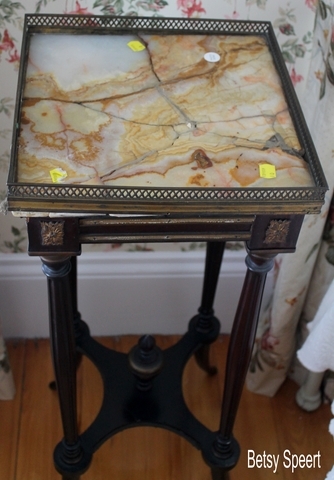 At the last auction we previewed, I noticed a really nice little table. The auction was on a day that I had to take my folks to the doctor, so Kris had to go by herself. We kept in close contact through email on our ipads. I was able to watch the auction on line. The auctioneer was going at a snail's pace, and poor Kris was stuck there all alone, bored out of her mind. I just love its shape. All it needs is a good waxing, and it will be a little star. Kris wants a chair in her bedroom. she does admit that it could be used for clothes throwing. When I re-invent it, it will not be tufted. We were in a store that had a nice large bathroom. In the bathroom was a wonderful 1930's chair. Come look at this chair!!!!! I didn't have any place in mind for it. But I love chairs like this. We got it for 20 bucks. Kris liked it better than the other chair, 'cuz it's not so "frou frou". 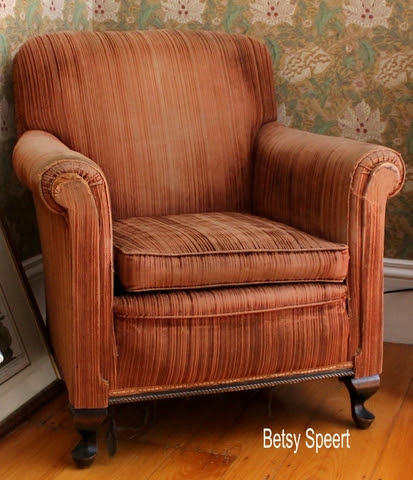 So, this chair is going in her bedroom, and the other one is going in the guest room. I keep heaping upholstery projects on my weary old bones. I hope my body holds out till my projects are done. I'll show you what I did to it in my next post!!! Don't you love cliff hangers????? Today is my birthday, and I'm 39!!!!! hang pictures in her powder room!!!!! I know how to live on the edge!!! 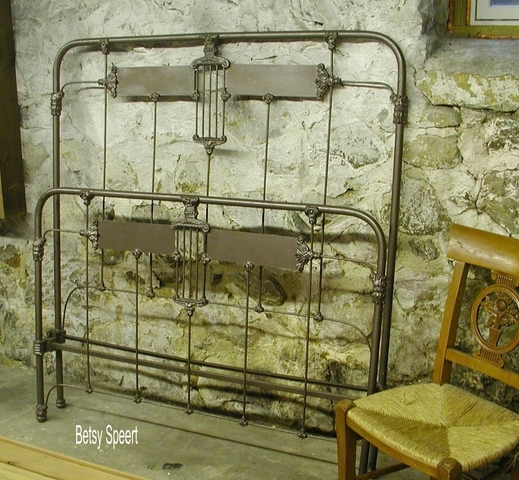 and choose a small piece to replace the top of the new antique table we got at auction for her guest room!!!!! so we could replace the broken onyx. We got this table at auction for 60 smackers. Don't they like broken @#$???? Let's get back to the master bedroom now that I've teased you with this peak. So I gave Kris a lot of light around her bed, 'cuz she be almost as old as I am. We put a couple of recessed lights over the pillows, so that Kris, and her husband Keith could each have their own source of illumination. the light only needs to be on over the spouse that is reading! and then I measured to her outside shoulder. but a little to the side. 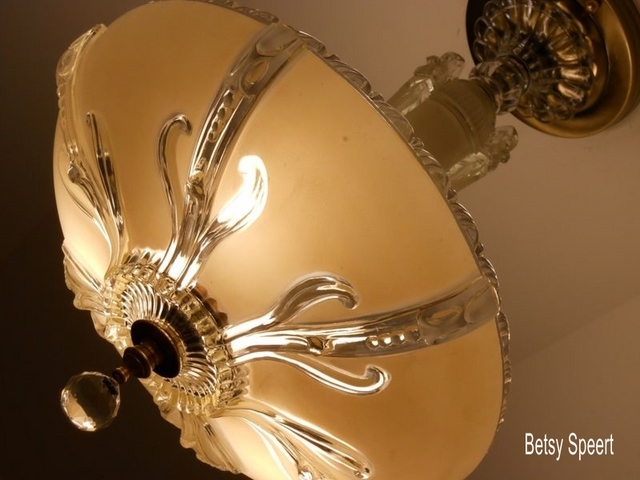 In the center of the ceiling we chose a 1920's fixture I found on ebay. It's nice and vintage, and gives a good all over glow to the room. On either side of the bed, we're using a pair of lamps from our inventory. They are unusual alabaster, as they have a red tone to the stone, that works really well with the colors in the space. Is then we get to use it!!!!! To answer the questions I got on my last post, about the draperies. 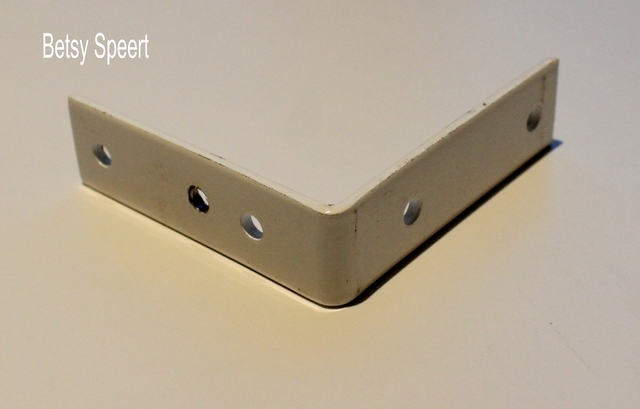 The wooden pole is cut in a miter, and then attached to the short sides with screws. Then the sharp ends are cut down, so the curtain pocket can make it around the turn. Making a big U shape. That's the way that my workroom makes the poles that return to the wall. 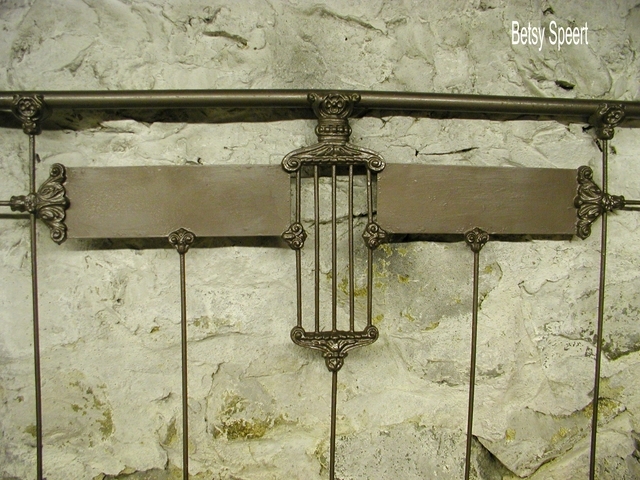 The way they are mounted on the wall, is with angle irons, or brackets, or whatever the hell they're called. Install one just under the L return to the wall. Then, if the draperies are wide, like the ones above, mount a second one a little way in towards the middle, but behind the draperies. And that's the secret about how you do that! At least if you're a big shot professional workroom. just cut the pole to the length you want, then mount the angle brackets to the very end of the pole. The bottom of the pole would be resting on the top of the bracket. and return to the wall that way. The gathered fabric, hides the bracket. The bracket will look like a continuation of the pole. This has been a very informative post, if I do say so myself!!!! I just realized I didn't answer the questions about how to make a double bed into a queen size. I will get to that next time. I want to thank everyone for the comments I've been receiving. They make me a happy camper!!!!! I have to figure out how I can respond on the comment page. I don't know how to do that, so if someone out there knows, please inform me. Let's return to my buddy and bidness partner, Kris's bedroom. We are in the process of redoing it, and I started showing it to you this past Sunday. Last week, I had the draperies installed. I like the way it pulls out the colors of the wallpaper, but isn't visually busy. The windows don't reach up to the ceiling, so to make them look taller, I plan on installing wooden Venetian blinds just up to where the drapery pole is installed, making the window look like it goes up that high. The top slats of the blinds stay closed, hiding the fact that there is just wallpaper behind it. Makes it look like the window goes up that high!!!!! In Kris's bedroom, we are still waiting for the blinds, but I've had the draperies installed. We had waited a year for these babies to go up. Looking good behind the bed!!!!! I had the draperies made to gather on a pole. The pole was mitered to return to the wall, and the gathered fabric covered the return. This makes for a full luxurious look, without a lot of fuss. 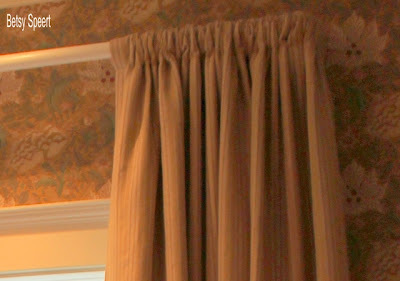 If you gather a drapery on a pole with a finial, you can't get the gathering to return to the wall, so the fabric ends up looking too wide and full. 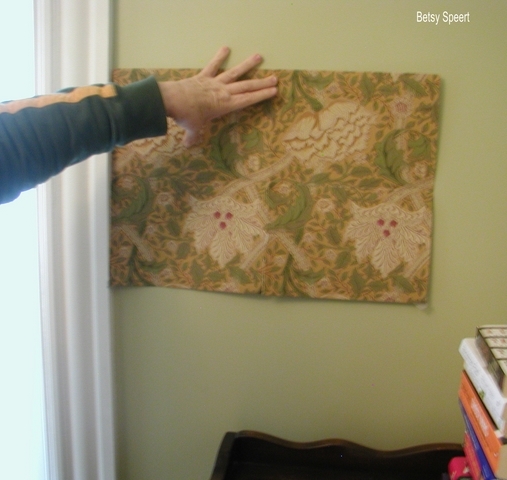 If it returns to the wall, some of the width is cut down by the turn, and you get the fullness of the fabric without it being so wide. I really need to take a shot of how it returns to the wall, so you can understand what I'm ranting about. We'll go over the lighting!!!!! I would like to share what I experienced last night. Every evening, around 8:30 or 9:00, I pour myself a glass of red wine. my doctor told me too!!!!! I'm not fibbing, he really did!!!!! Now this kind of medical advice is right up my alley!!!!! Last night, I was opening up a new bottle of wine. My brother David doesn't bother to take off the metal seal that covers the cork, before he inserts the corkscrew. that's how I now do it too. Last night, I inserted the corkscrew and screwed it into the top of the bottle. It went in really easily. But I couldn't get any purchase on the cork to pull it out. So, I tried to peal off the metal seal, to see what was up with this cork. I couldn't get the metal off!!!!! So I got out a paring knife, to try to cut into the metal, to start a place where I could start pealing it. then I tried to cut around the seal to maybe get a cut going in the place where it was indented in the top. it was a twist off. I didn't know good wines came like that now. I usually only show completed projects. I wait until they are all done, and then I show the steps I took to get to the finished look. I noticed that I get a big kick out of seeing the stages as they progress on other blogs. today, I am going to show what my buddy and bidness partner, Kris and I have been up to in her bedroom. Today I am going to show what my buddy and bidness partner, Kris and I have been designing in her bedroom!!!!! Now come with me as I show you our journey up to this point. When I first met Kris, she had only been living in her home for 1 or 2 years. She and her husband had bought if from a man who had lived in it for some time, and not kept it up. 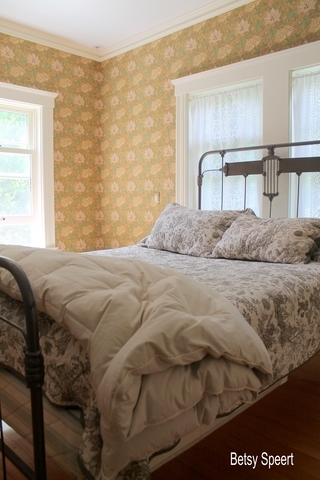 This house was built in the late 1880's and needed a lot of TLC. Kris hired me to do the living room, and then we attacked the house one room at a time over the next decade or so. now, I'm retired, and don't get paid for design no more, no more. BUT, Kris is still getting me to decorate her home, 'cuz she's my buddy and bidness partner. and she gets me to do her house. One of the things I love about Kris, is she doesn't worry about a room not being great before she redesigns it. She will live with it in a state of less than fabulousness, while she saves her money. Then, when she's amassed a pile of moolah, she attacks full speed ahead and decorates balls to the wall. 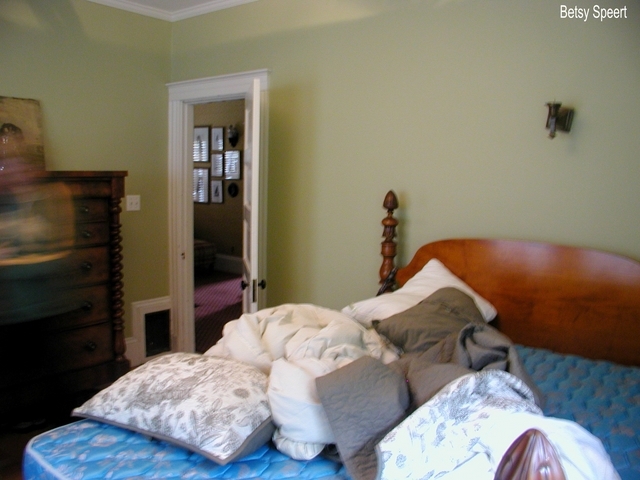 This year we are working on her master bedroom and her guest room. This is the way the room looked when we started on it. She was in the process of changing her sheets when I took these pictures, so ignore that the bed's not made. This was the view into the room from the hall doorway. Next is the view from the bed towards the closet wall. And lastly is the view towards the door into the hallway. Kris was a really good sport, letting me take these before shots, when the bed wasn't made. I don't want you to think that this is normal. One of the big problems in the room was not enough storage for both Kris and her husband Keith. I got them to kick the kids out of the house, and now they use the closets in both kids rooms too!!!!! Isn't it wonderful when kids get old enough to leave????? 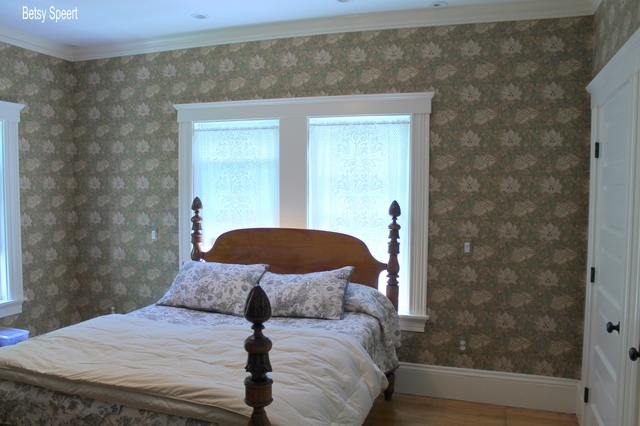 When Kris and I started on this project, the first thing we did was choose wallpaper and fabric. I wasn't allowed to do any flowers, 'cuz Kris's husband is a guy. Guys are no fun at all. 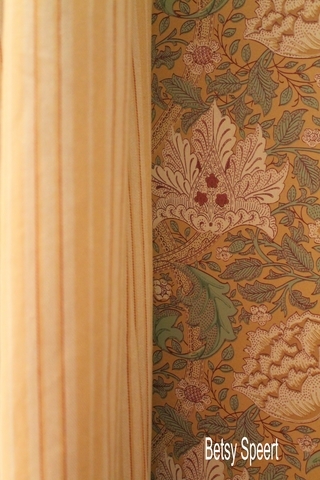 So we found this Arts & Crafts style paper from Morris & Co through Zoffany. Now what's important when doing a paper that is this visually busy, is to be sure that you break it up with a lot of mirrors and prints and plates and stuff that will cut into all the pattern. Otherwise it will be overwhelming. I put together a scheme that worked off the paper. So, now it was time to do the construction on the room. In tackling this space, the first thing Kris did was remedy the closet situation. 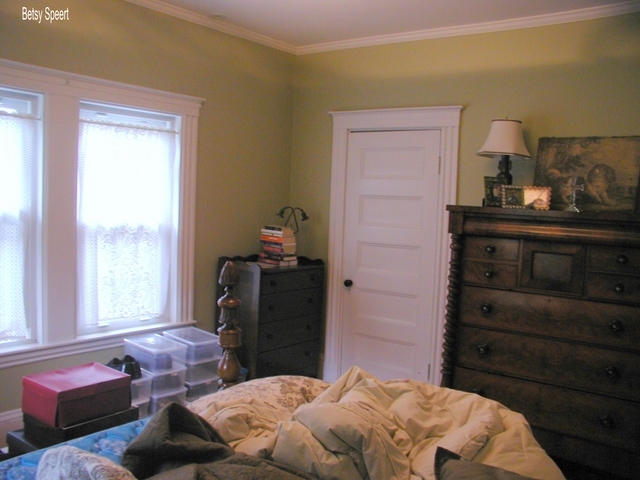 She stole some space from the closet in the guest room, and added another door to the closet in the master bedroom. This way she was able to double their closet space. 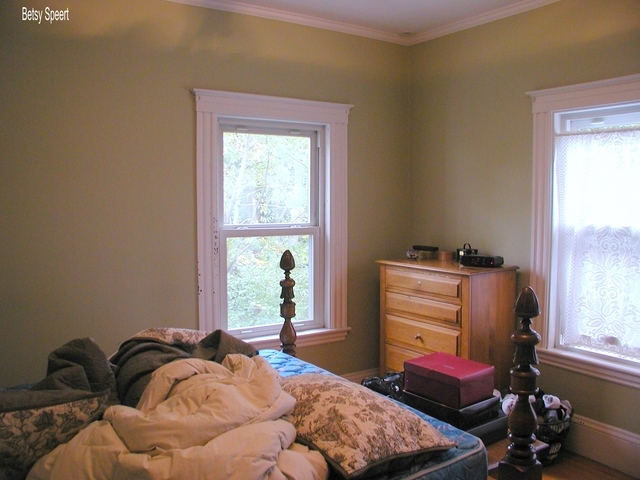 I had her move the bed to in front of the windows, making the room feel twice as big as before. 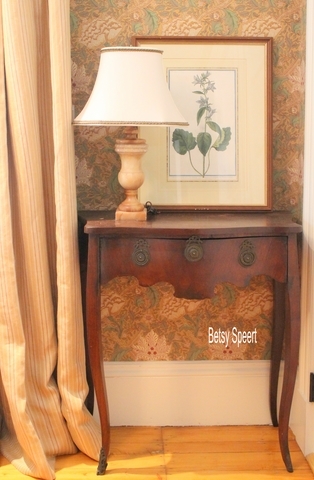 I also had the hall door hinged the other way, so it could open against the closet wall, opening up the wall opposite the bed for a nice chest of drawers. 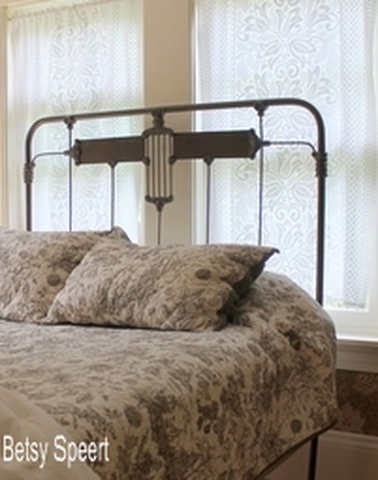 I found a handsome gunmetal bed on ebay that wouldn't block the window like a wooden headboard would. Kris stored it in her basement until this year, when I made her drag the damn thing up to her bedroom and set it up, already. I love the detail of the headboard. I'm going to paint words on the flat part of the metal. all you need to do is have the side rails made a little longer. The way the mattress overhangs the sides isn't that noticeable, only 3". We used an iron worker to lengthen the rails. We need to choose bedding for the bed. That's the fun stuff to do, and instant gratification. but my shoulders are getting sore from sitting so long at my computer. So I will continue this story on Tuesday or Wednesday. This month I am going to make.... wait for it....over one hundred dollars!!!!! Home Goods for 100 smackers??????? Only problem is, I have no more room in my tablecloth drawer. No more room for glasses and plates. Or silverware for that matter. you may be wondering just why the #$% I write this damn thingy anyway. oh yeah....youngest of 5, close together in age. I want me some attention, damn it!!!!! BUT WHERE ARE THE COMMENTS???? I took off the word verification dealio, so you could leave them without any problem. I feel like we're dating, but you never call me. I did just go for my biannual hair cut and color, so I'm looking pretty spiffy!!!!! who was I going to help?????? let's get to today's post. Now, just for the record. I don't give free advice anymore!!!!! But some of you don't seem to have gotten the memo!!!!! So recently I was emailed some questions from one of my readers, and I felt that they were generic enough to be interesting for everyone. So I emailed this person back and let her know that I would be answering her plea. she's flooded my mailbox with more pictures and words and stuff. IF YOU KNOWS WHAT I MEANS!!??!! You are one funny girl. I remember the Aerosmith kitchen, as well as the lake bedroom you did, and purchased your book, one of them anyways, soon after. Then, as I thought it was one of the books that a cup of coffee got spilled on and ruined, I bought it again, only to discover the first one had survived the coffee debacle. Just wanted you to know. And, it is still a relevant book i think, even though everything is gray gray gray these days, and have to feel bad that I still like color but now it doesn't look right...blah blah. But let me get to the more serious point. I am a decorator, not a designer, no degree, but somewhat steadily employed, until the last few years when I followed my team USA figure skater around the world. I currently work for a store in town as their in-house designer. It is the current rage of horse prints, and yes, they are the rage, giant black and white closeups of horse faces, and the gray trend. No color is allowed in the store except a pop of charteuse in one pillow, haha It is a beautiful store, despite my kidding, and has influenced me I think to my detriment. I have what Mary McDonald has. I do or see a beautiful home, and think, I want that, and then I start, and it doesn't work, and then I start again. sigh. So heres my problem. I will send some pictures from iphone, as I am too lame to figure out how to get them up on my computer. 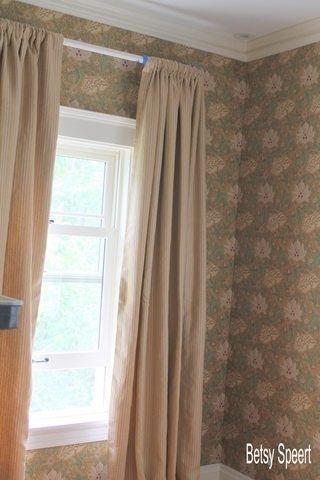 I am on a house tour in the fall, and want to have my home look great, and be the talk of the town (it won't), but...I always knew what I liked, and I liked color, and toile, and french. Then, all of a sudden, I joke two weeks ago, I wanted plain, no color, earthy, simple. 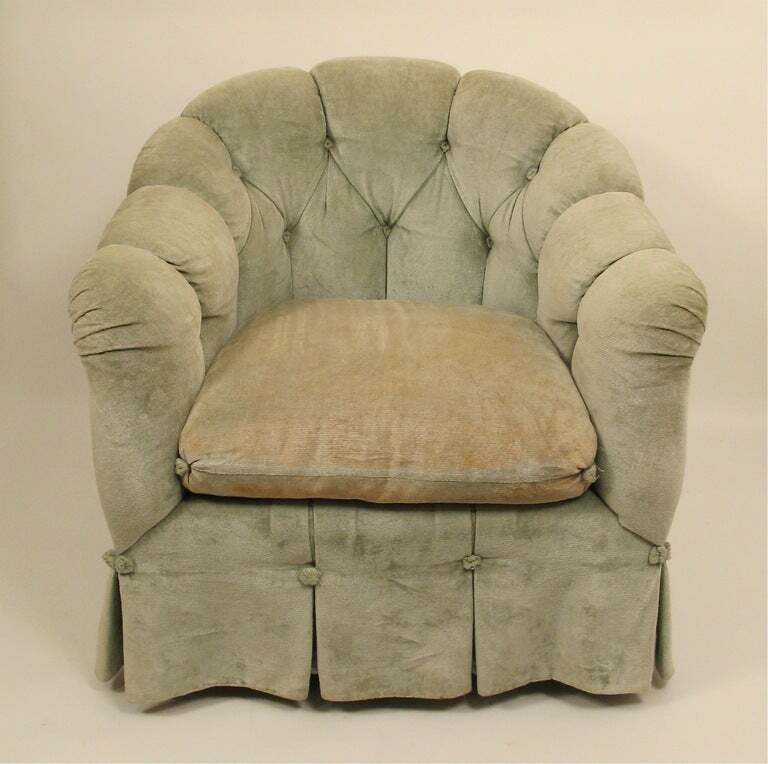 I have tried at least 3 paint colors, and have two button tufted barrel back turned leg chairs for 4 months at the upholsterers, unable to decide on a fabric or a look. I also have a round tufted ottoman there. I just painted the walls, they don't go with my silk curtains!!! I have held on to the toile dining chairs, a 25 year old set, with the old toile. This room (rooms) are keeping me up at night. I no longer know where I am going or what I like. I have a theory. I am a new empty nester who has a minute to project who I am, and I suddenly don't know. I am a born free spirit, generally unconcerned about what others think, as I try hard and am nice. All of a sudden, its as if the blog police are going to visit me and condemn my taste. The Gong Show. So, please, pretty please, free advice. I admire you. Paint, placement, chair(missing from photo) fabric. I am stuck. Even if you do not answer, I still really like you. and she answered with this. I am including this, so you can understand some of her furniture choices. I am literally, not figuratively thin skinned. Menopause. I will grow an extra layer. So excited. I really do want your advice. I am sending more pictures, and will give this brief background. Home is 10 1/2 years old. We built it. Many choices I would not make today, but a warm home, not over the top with fancy, just pretty. Most of my stuff, which you have mentioned, working around old stuff(you called it crap! ), stuff I inherited from my mother in law, whom I was close to, or gifts bought by parents, or ...you know the drill. I am always working around something I didn't choose. Sofa is vintage Kittinger from Williamsburg, antique piano of my parents, curio was my father in laws parents. Dining set a gift from my dear Mom, etc. I welcome all of your comments, as I really am bugged that I can do others homes so effortlessly, and cannot see my home as it is. Mary McDonald also said, "I am my own worst client!" That's me too. Looking forward, and look for additional pictures. I do not own a real camera, but my son does if you need better quality. Thank you thank you!!! First, I have to share the picture of her dog. let's get to the decorating, already....sheesh. The first room shot she sent was this one. Holly, start collecting creamware or light colored plates to hang on the wall around the mirror. You'd be amazed at how it would warm the space up, yet still keep the clean lines. Place a plate above and below the wall sconces, then maybe three over the top of the mirror. I've never been a fan of Queen Anne and Chippendale sofas. They don't look cozy or inviting to me. With everything in the room having legs, it looks like a sea of sticks. I think, if you had a plumper skirted sofa against the wall, it would do wonders for the space. But if money's an option (ha), how about a slipcover with a skirt instead? When you first sent me this picture, I was thinking, if you want the draperies to match the room better, how about painting the walls pink??? I was thinking of a softer pink, with a white ceiling. But then I looked at the brown walls again, and they're definitely growing on me. 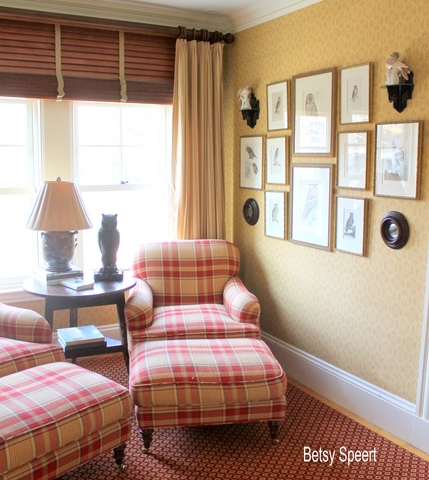 I have a fondness for silk taffeta plaid, so the draperies are good, and I like them against the brown of the walls. 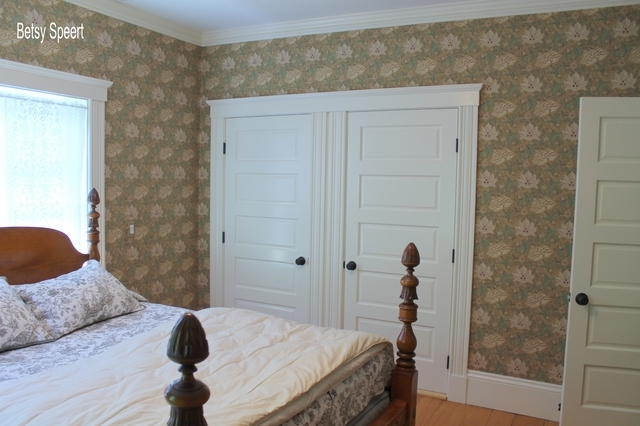 Here's a shot of Holly's room before she painted it pink. The curio cabinet is much better in it's current position, flat against the wall. In the shot above, I see the barrel back chairs you have waiting to be reupholstered. Never do them the way they are in the shot above again!!!!! Being nice, I'll give you some suggestions, so you can have them done, and get some more furniture in this room for your home tour. They didn't look good in the green silk either, so there. But instead of those tufted buttoney things, use a simple button. 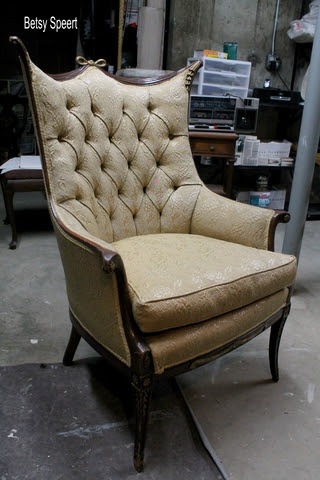 Here's a shot of the first chair I ever upholstered. 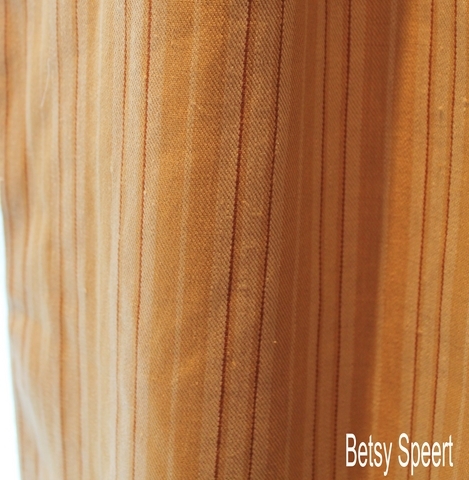 Don't do a gathered skirt, but a box pleated one could be good, or just a flat one with inverted pleats at the corners. 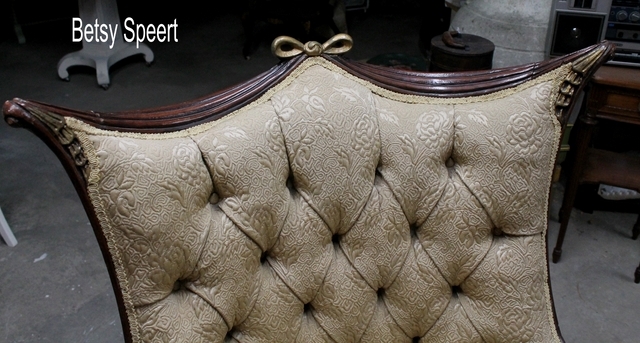 For the cushions, have the upholsterer, wrap them in dacron to add some crown to the tops. I prefer the boxed sides, like you have, but they are too flat. JUST STICK TO ONE FABRIC ON THE CHAIRS!!!!! 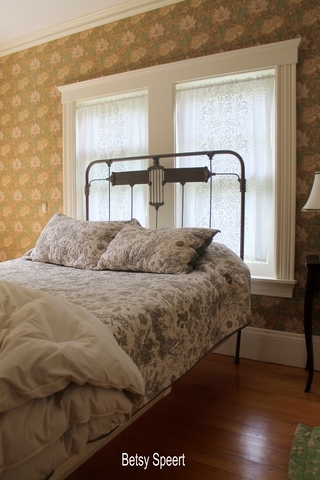 With the cocoa colored walls, it should have a simpler, more sophisticated vibe. You could use the taffeta that's on the windows, or a plain white like the sofa. My head is now spinning around, because you have two different furniture placements in your photos. In the first picture, you have the curio cabinet with a Louis the XV chair. the lamps are too tall. They are almost as high as the wall sconces. 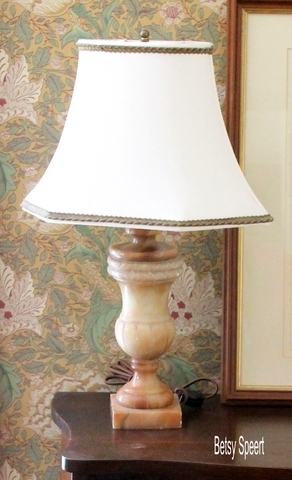 Get shorter, squatter lamps, and while we're at it, get bigger end tables. One of the problems in your room, is the stuff seems to be floating around because it's not big enough. Glad you wanted my help????? I like the table with the French country chair next to it. Now don't go getting excited, because I'm about to diss your draperies. Is that a balloon shade valance along the top????? 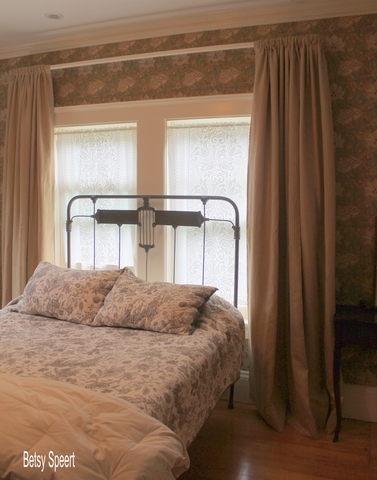 Can you get rid of the valance and just have the draperies????? Or, change the valance to just being flat. If the valance was interlined with a thick interlining (like felt) it would have the body to poke out a little to give a luxurious feel without the dated feel of a balloon shade. Now let's talk about the toss pillows on the sofa. Is that a grain sack pattern fabric? Not good with the plaid silk taffeta. 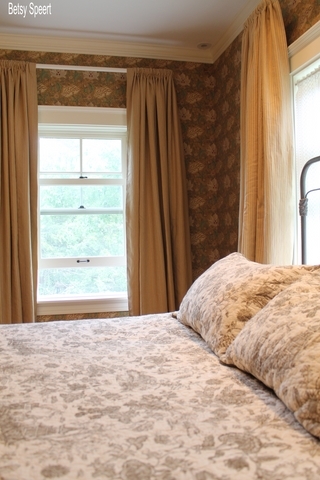 I would go back to your pink toile pillows, they pull in the dining room, and work with the plaid. I would put a rug in this room. How about some natural fiber, like sisal or seagrass????? It would work off the plain rug of the living room. While you're collecting the cream colored plates for the wall, how about hanging one above each picture on either side of the china cabinet. I like the chairs at the end of the dining table!!!!! Overall, your home is very pretty. I appreciate that your were working with furniture that has a high sentimental quotient. I have a niece that I give all that stuff to, so I only have the furniture I like in my house. I would paint the newel and the handrail white on the balustrade. Now I hope all you guys reading my blog have learned something from this. Namely, don't go asking me for advice. A Mystery at Betsy's House!!!!!! !